EDIC. ORIG. USA CONTIENE ENCARTE INTERIOR CON LOS TEXTOS..ETC.. 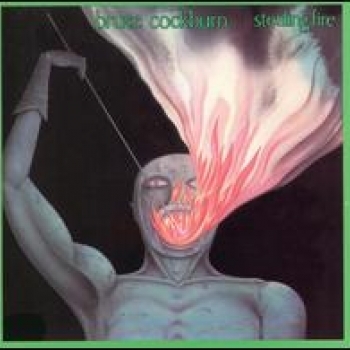 respetado cantante y compositor canadiense , siempre interesante conocer sus discos..with 1984's 'stealing fire', bruce cockburn's words and music took on a greater urgency than ever before. the previous year, he made his first trip to central america on behalf of the international development group oxfam. while in southern mexico, he visited a refugee camp that had recently been attacked by the helicopters of the u.s. - backed guatemalan army. the horrific experience sparked the anger-filled 'if i had a rocket launcher,' a song which brought him unprecedented attention  garnering heavy radio airplay and regular video rotation on mtv. 'stealing fire' is full of many of cockburn's most powerful political songs, yet it boasts some of his most romantic numbers as well. from 'lovers in a dangerous time' to "making contact," whether issuing calls to action or cries for help, bruce cockburn's poetry demands attention. upon its release stealing fire immediately staked a claim as one of the most compelling albums by any singer-songwriter in the 1980s. nearly twenty years later, the album's impact is undiminished. (adapted from nicholas jennings' liner notes). Bruce Cockburn - guitar and vocals Jon Goldsmith - keyboards, background vocals on "Maybe the Poet" Fergus Marsh - bass and stick Miche Pouliot - drums Chi Sharpe - percussion Rick Shurman - ground effects on "Maybe the Poet" Vein Dorge, Jerry Johnson, Mike Malone, Rick Tait - horns on "Making Contact" Joel Feeney - background vocals on "Lovers in a Dangerous Time" Paul Henderson - background vocals on "Lovers in a Dangerous Time" Shawne Jackson - background vocals on "Maybe the Poet", "Making Contact", "Peggy's Kitchen Wall", "Morning Star" Carole Pope - background vocals on "Maybe the Poet", "Making Contact" Leroy Sibles - background vocals on "Maybe the Poet", "Making Contact" Tim Ryan - background vocals on "Making Contact" Judy Cade - background vocals on "Peggy's Kitchen Wall" Kerry Crawford - background vocals on "Peggy's Kitchen Wall" Jon Goldsmith - background vocals on "Peggy's Kitchen Wall" Colina Phillips - background vocals on "Peggy's Kitchen Wall", "Morning Star" Sharon Lee Williams - background vocals on "Peggy's Kitchen Wall", "Morning Star"